Piet Mondrian was born in the Netherlands in 1872. He was influenced by many artistic styles and even helped found an artistic movement called De Stijl. He died in 1944, have created about 250 paintings in his lifetime. The paintings that Piet Mondrian is most famous for are rectangles of white and primary colors, dissected by black lines. He did not always paint this way, however. Mondrian’s first paintings depicted scenes found in real life. They were done in a style similar to impressionism. As his style grew and changed, he stopped using any colors besides the three primaries: red, yellow, and blue. The painting shown below is Avond. 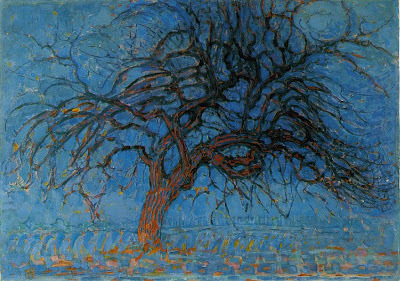 This is the first painting in which Mondrian used only primary colors but you can still see the influence of impressionism. Mondrian soon became interested in cubism. Cubism, which I have not yet posted about, is an artistic style in which the subject is broken into meaningful pieces and rearranged in a new order to show the most important parts of the object. 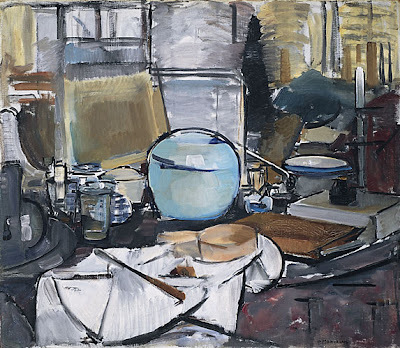 The painting shown below, Still Life with Ginger Pot, was painted by Mondrian in the cubist style. Because of the influence of cubism, Mondrian’s paintings became more and more abstract. Mondrian moved to Paris in 1912 so he could further study cubism. In 1914 Mondrian returned home just before World War I broke out. He was stuck there for the duration of the war (1914-1919). During this time he became friends with some other artists and together they began the new movement, De Stijl, which I posted about yesterday. The movement was called De Stijl because that was the name of the journal that Mondrian and his friends started. They called the movement neoplasticism and today both names are correct. The members of the De Stijl movement were searching to paint an even more honest truth than the cubists. They believed the essence, the foundation of all things could be found in the simplest form: straight lines and primary colors. 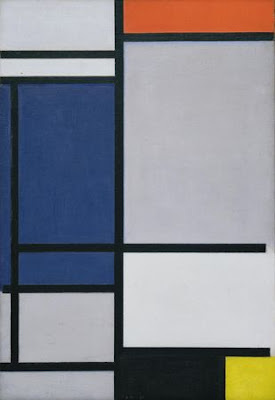 So Mondrian began painting pieces like the one shown above, Composition. Tomorrow I’ll teach you to make your own Mondrian-inspired painting. I am new to your blog, but I wanted to thank for your helpful art ideas for kids. You information is such a great resource for me. I have two young kiddos of my own and also teach children twice a month. It is so much fun! Your blog has really helped me. Thanks again! Wow! Thank you both for the high praise. Just so you know, there are a lot more resources in the sidebar. Many of the blogs listed there are maintained by art teachers with tons of fantastic ideas. I am doing an art report on Piet Mondrian and this is a very good source! !